Andy has created the perfect multi-phase transformation effect that is not only easy to do and easy to follow, but has an instant performance hook and quick reset. With its gambling theme and the awesome visual changes, this will be a GUARANTEED winner in your close-up set. 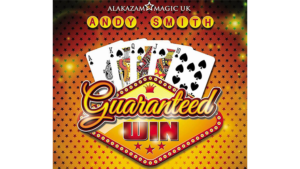 Brought to you by Alakazam Magic and Andy Smith, GUARANTEED WIN is a multi-phase packet trick that results in a guaranteed win poker hand, despite what your eyes tell you. After a brief introduction, the magi shows a packet of four cards he’s holding to be all Jokers. The spectator is given one of the Jokers to examine as the magi gathers the other cards. The spectator is asked to select a card from the deck, assisted by the magi of course, and the selected card, a Ten of Spades, is added to the packet held by the magi. Despite having shown the packet as four Jokers.. the magi now shows the packet to consist of four Tens. The magi places one of the Tens on the table, introduces a Guaranteed Joker and explains its significance to the spectator, and adds it to the three remaining cards in his hand. With no apparent handling, the magi shows the four cards in his hand have changed to the Jack of Spades, Queen of Spades, King of Spades, and Ace of Spades… all of which are placed with the Ten of Spades on the table to create a Royal Flush… A Guaranteed Win. I encourage you to go to Murphy’s site, at the below link, and watch the video. You get a better idea of the visuals of this effect watching Andy perform it.. There are a couple of fairly unique handling ideas that took Andy several years of experimentation to perfect. He didn’t want the magi to hold a hand full of cards. He finally settled on a method that enables the performer to hold, at most, five cards at any moment. But, the fifth card is never visible thanks to the gimmicked card. The only point where I might have a very minor disagreement is saying the effect is ‘easy to do and easy to follow’. It is NOT difficult, but it will take a little practice to remember the proper orientation of the cards. Remember though.. we’re only talking four or five cards here.. The total running time of the DVD is just over twenty minutes, and you’ll learn everything you need to know in that short a time.. so it can’t be very hard, now can it? All I’m saying is.. you’ll have a short time of watching the DVD with cards in hand as you learn the handling. It’s not self-working.. but it’s definitely not more than 30-40 minutes of work. You’ll be taught a very basic flustration count and a simple card force. That, along with the gaff card, is all you need to perform Guaranteed Win. This effect WILL fool your audience. It’s well-suited for table hopping and walk around.. as long as you have a small surface on which to place a couple of cards. I recommend it to my friends and readers… Well worth the cost. $19.99 at dealers who carry the Murphy’s Magic line of products..
“Many years ago, it was said that when kings died, they didn’t abandon their villages, their walls or their empires. There was something left in them that continued to fight for their people. In this way, their people could continue living in harmony, peace and equality. As I mentioned in a recent review of another deck… reviewing a deck isn’t easy. I can tell you what I like, or dislike, about it, but ultimately it’s a matter of personal preference. It’s like my Hawaiian shirt… I love it.. and my wife hates it.. although we generally share the same general taste. Kings live.. and Kings die. When they pass, they leave a Legacy. Hopefully, they will leave a good legacy, one to be remembered fondly. 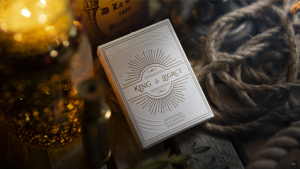 Designed by Destino (Destino Magico) and presented by Julio Montoro, (Sketch, Rejoined, and Pocket.. in partnership with Joao Miranda), King and Legacy strives to present the user with a gracious deck of well-designed cards, totally original cards, with the bonus of being a marked deck, capable of a wide variety of effects not attainable by a normal deck. I REALLY regret saying this.. but the deck, as attractive as it is, has one weakness; the markings. I don’t have young eyesight, but I do wear glasses. Regardless.. I cannot read the markings unless I’m in very bright light… and the card is held about a foot away. To say the marks are small (to me) is slightly an understatement. They are clearly marked and not ‘coded’ to reveal the identity, yet, you do need decent vision to read them. After being unable to read the markings in normal room lighting, I took the deck to a meeting with seven other magicians. In a well-lit restaurant, five of the seven could not read the markings with the card laying on the table in from of them. I really dislike saying anything negative about a deck designed as appealing as King and Legacy, but I do have an obligation to say this.. up front. Buy KING & LEGACY because of their handling and their unique appearance. They are very affordable, and you may find everything works exactly as the creator’s intended. I’ve included a link to a 30 second video to give you a true view of the deck and their original face and numerical design. $13.95 .. From dealers who carry the Murphy’s Magic line of products..
Side note.. When I open a new deck, my FIRST move is to perform my personalized faro. If the deck is cut properly, with fresh blades, I’ll hit a perfect-to-near-perfect faro, without any real effort, the first time. If I have to break the cards in before I can faro.. I’m not happy. – Including BONUS effect, using your own business cards! I agree with all the statements in the ad copy. There isn’t a claim NOT true. It’s original, easy to do and easy to set up, instant (almost) reset, extremely visual and very strong for walk-around. Steven includes a well done 35 minute video, filmed in HD, that explains all the details in.. well… detail. As with most rubber band effects, there’s a little more involved than simply putting a rubber band around your wrist. But, there isn’t a LOT more involved. With a few minutes practice, you can go from a normal state to full battle mode in about three or four seconds. Steven does it in less than a second.. but he’s well practiced. Now, to the fine print… There is some prep involved. I debated whether to go in to detail, in fairness to the creator, and decided to elaborate a little about the vanish. If you watch the video at Murphy’s site, you’ll see the performer holding a broken rubber band above a cellphone held in the other hand. With a toss, the band is ‘thrown’ toward the phone. The phone suddenly has an intact band surrounding it.. and the broken band is gone. (Watch the video). This happens so quickly it does appear to be some sort of camera trick.. but of course.. it’s not. I think most of us know that to vanish a small object, some sort of device is necessary.. and that’s the case here too. Fortunately, most of us have one of those devices in a cigar box.. back in the bedroom .. collecting dust. They are only a couple of dollars if you don’t happen to have one. In fact, I used to use a small, round piece of elastic from my mother’s sewing box when I was young. I tied it to a safety pin, attached it to the inside of my sleeve about elbow high, and attached the other end to a paper clip. I could vanish a paper clip as good as any fourteen year old. There are a couple of other effects taught as well. One has the rubber band jumping from one cell phone to another.. and a third effect has bands jumping from a cell phone to a stack of business cards.. which then makes it easy to hand out a card to your spectator. Again, both effects are very easy to perform, using basically the same setup, and offer you a trio of effects on one video. Overall, some may think fifteen dollars is a lot for a rubber band ‘trick’.. but it’s not, -if- you use it. 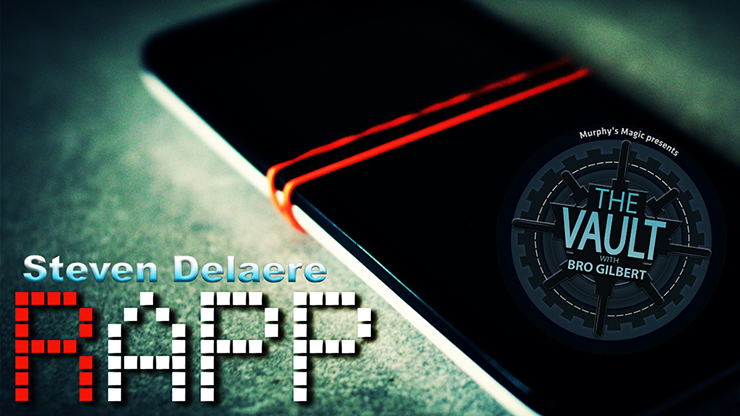 I use it, and I am definitely recommending RAPP to my friends and readers. $14.95 from The Vault at Murphy’s Magic. This is an instant download. MAGIC ROADSHOW Journal of Magic #197… FREE! Three more to go! Not that I’m overly excited about ending the Roadshow, but I AM excited to see what we’re going to do next. I know I’ll still be very involved in magic.. and I know I’m going to try to involve all the Roadshow readers… but I’m not sure in what direction we’ll coalesce. It WILL be rewarding.. I promise. Politics? Anyone want to talk politics? I’m about as sick of politics as imaginable. Had to unfriend some friends on FB just to get away from the incessant chatter. So, if you’re one of those guys.. it’s nothing personal… just wanted to go in another direction. I wanted to talk about my favorite TV shows, Netflix, old cars, cats, dogs, the beach, the mountains, magic, music, the blues, new inventions I don’t need.. but want, sharp cutlery, really old checks and documents, the expanding or shrinking universe, religion, and food… Not in that order. I considered writing a small autobiography about myself to include in the final issue, just so you guys can see what a really boring guy I can be, but I think I just covered everything… aside from my loved ones and my friends. Folks.. there’s a small wealth of information in this Roadshow. Free PDF’s, instructional videos, lectures, reviews, auction information, and magic on TV now available online. Hurry through it if you want.. it’s your loss.. my friend. This issue is 42 pages (86 counting our PDF) and 11135 words..
-Potter & Potter Auctions’ – Johnny Fox’s Freakatorium. EFFECT: Five coins are introduced – four half dollars and one copper British penny. Two coins are placed into the left hand and two into the right. The copper coin is placed into the RH. With a magic movement, the hands are opened to show that one of the silver coins has jumped from the left hand to the right! The coins are returned to the beginning positions and this time BOTH silver coins jump from the left hand to the right! Five coins in the RH and none in the left! You’re left completely clean! METHOD: Some may know this immediately as two of the best sleights in coin magic – Han Ping Chien and the Gallo Pitch. Both sleights have the same basic function – but with different outcomes. KNOW THE DIFFERENCES between these two sleights! Place the two silver coins from the left side into the LH. Then pick up the other two silver coins into your RH. The LH now picks up the copper coin with your left fingers and “suspiciously” places it into the RH fist to join the other two coins. You want a reason to “re-show” the coins ala Han Ping Chien! Begin by secretly maneuvering one of the silver coins in your RH, into Classic Palm. Pretend as if you need to show the coins again. Open your LH and turn it so that the two coins are dumped onto the working surface. Pick up the two coins with your LH and arrange them so that one of the two coins is close to the edge of your palm (nearest the table). Now bring attention to the RH by pointing to it with the left index finger. Display the three coins on your open RH. Now turn your RH over and dump two of these coins (one silver and one copper coin – the third coin remains in Classic Palm) as you secretly release the silver coin in the LH that is closest to the table. It should appear as if you dumped the 3 coins in the RH onto the table. There will now, secretly, be one silver coin in each hand! Pick up the 3 coins with your RH being certain that you don’t “flash” the silver coin palmed there. Do the magic and show that one silver coin has jumped from the LH into the RH! Claim that the copper coin caused the attraction. Replace all of the coins back onto the table, exactly as they were in the beginning. Begin by picking up two silver coins with the LH and then closing that hand. Then pick up the two silver coins – only – with RH. Secretly place the two silver coins in the RH, into Classic Palm. Bring attention to the copper coin on the table. Repeat your patter that the copper “attracts” silver. Pick the copper coin up with the LH and insert it suspiciously, into the closed right fist. Act as if the spectators are suspicious of your actions! Now you will “re-show” all of the coins via The Gallo Pitch. With the palm down LH, toss the two silver coins in the LH onto the table at a 45 degree angle, to your right. As your LH retrieves the two coins, your RH begins the toss of its “three coins” (actually just the copper coin!). These two “tosses” should form the letter “X” on the table. The point where this imaginary “X”, intersects is where the “dirty” part occurs. The LH hand (having just retrieved its coins), pulls back to its starting position and turns palm up as it secretly tosses its two coins off to its left, in line with the tossing RH. It should appear as if all 3 coins in the RH were tossed. Reality check: After this toss, there will be no coins in the LH and two silver coins Classic Palmed in the RH! There will now be three coins (one copper and two silver coins) on the table that have apparently been tossed from the RH. Pick up the 3 coins on the table with the RH, without exposing the two Classic Palmed coins! Do the magic and show that the RH now holds all five coins and no coins in the LH. This is very strong magic – you can tell by the “blank looks” on your spectators’ faces. Simple yet effective! NOTE: I have been performing this particular routine for about 25 years now and it never ceases to amaze the spectators. It is sort of an assembly routine, but without the extra displays, shuttle passes, loads, etc. It is actually quite simple to perform and accentuates two of the most powerful (and unknown sleights) in coin magic. When I say “unknown”, I’m talking about unknown to lay people. These two sleights are not difficult to master! They don’t require extensive “knuckle-busting” sleight-of-hand – but, instead, require finesse and fairly careful “routining”. A little bit of practice will show that this routine is pretty easy to perform – yet packs a BIG punch.. Some of you may not know Eric. All of you should..
Aside from being a first rate magician and comedian, Eric is a full-time business owner and the proprietor of two comedy clubs in Ohio. If that doesn’t keep him busy, he has served on various committees in and around Warren, Ohio, served as an elected official, serves as a fireman and paramedic, performed across the United States as a comedian in comedy clubs and as a magician for corporate events and parties. Headlined shows with the like of Engelbert Humperdinck and George Carlin. Performed with Michael Stanley, Kenny Loggins, Peaches and Herb, Sly and the Family Stone, Peter Yarrow, and The Spinners.. among others. Hand made in Holland by Jan Kosters, Opkoopjes mouth coils are made by a professional, for the professional. Those of you who use mouth coils on a regular basis are probably familiar with the problems of typical inexpensive coils. Many tear. Some are so tight they refuse to extend properly. Others are only a fraction of the length of Opkoopjes. These are made for performers who want to give their audience the ultimate effect. Each coil cost the performer roughly $2.50 to $2.90 per use, depending on which length they use. Opkoopjes coils come in 46 foot and 62 foot length, so you have a choice based on venue and stage size, as well as the size and age of your audience. Each package comes with 12 coils.. ready for your performance. Jan has provided a PDF download for anyone not familiar with the use of coils. He also includes ten videos to help familiarize you with the use, care, personalization, color usage and specific do’s and don’ts of his product. I understand the price will be a turn-off for some performers.. just as the price of a Vernet thumb tip or quality playing cards. Lets face it, some performers are willing to make do with lower quality products. I’m not being critical. Everyone is responsible for their own expenses and keeping their performances profitable. But… and those of you who have read this far probably already understand, there are a group of performers who insist on using quality products, as they feel it will reflect on their performances. I don’t think I have to sell you guys. You are probably already thinking of the possibilities and understand the importance of a quality product. All coils are available in white, plus Christmas coils, Halloween, Patriotic and Rainbow. Jan will make your coils in custom colors with a minimum order of approx. 5 dozen. Also, any order of $50.00 or more will get free shipping from Jan -if- you are unable to find the coils through your favorite Murphy’s Magic dealer. These coils are perfect for children’s shows and school assemblies. They are also perfect for that moment when you want to make a lasting impression on your audience, regardless the venue. A new online Mentalism store called “Mentalistry”, as an introduction, is offering a free 81 page Mentalism PDF sampler involving their core authors. The book has a nice variety and gives a small taste of the creators involved. If you are a fan of mentalism, this will be one of your favorite, if not most favorite, free ebook of the year. I highly recommend it.. To quote from their site…. “Within these pages lies simple, direct, impactful, published and unpublished mentalism material written by a selection of authors who are considered, by many, as experts in their respective fields. These authors each have their own style; their own outlook on the art form and so, in theory, there should be at least something for everyone contained here. All you need to do is go to their signup page and leave your email. In a flash, or two, the download link will magically appear in your inbox… Enjoy! When we think of magic it often conjures up brightly decorated tubes, boxes, rabbits, doves and the usual magic tricks and paraphernalia that magicians normally use. 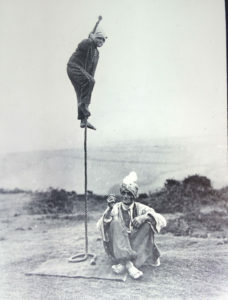 However over the years there have been some performers who have resorted to other forms of magical entertainment. And so for Dixie Annie Haygood (Nee Jarrett) born in 1861 in Baldwin County, Georgia U S A, she too was to become a magician who never used the traditional magicians props. 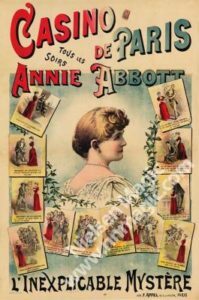 Little Annie was to soon become known as,” Annie Abbott the Georgia Magnet” with an act that would take her right around the world. While she never disclosed how her powers worked, she became known as a magicienne and top vaudeville entertainer. During this time there were a number of other imitators or magnetic performers, each copying the other. Hypnotism and electricity were new phenomena that offered the opportunity for performers to capitalize on these new found realities by suggesting that their powers were somehow related to electrical forces and hypnotic suggestion and magnetism. In 1884 Annie and her husband witnessed a strange act on their local town hall stage by a woman named Lulu Hurst. Lulu it appeared could cause a group of men to lift her up when she wanted them to, and then when the men tried to lift her again, they were unable to do so. It was this performance by Lulu that triggered Annie to work out how it was done and then by 1884 she presented her own version to the public. Being such a petite lady only 5ft tall and weighing less than 100 lbs, she immediately made a hit, as Lulu Hurst was a much heavier lady. Annie’s act consisted of holding a billiard cue in one hand while a group of men tried to force the billiard cue to the ground but were unable to do so. Somehow Annie had developed above-normal strength. Four men would try to lift her off her feet but again were unable to budge her. Again the four would try to lift her and failed but when Annie willed it, they then found they could. Then by placing her hand on a man’s head she was able to lift the man off his feet seemingly with no effort at all, yet four men could not do the same with her. Holding a billiard cue out in front of her, the same group of strong fellows were unable to move her backwards. After her husband was shot dead Annie decided to perform her new found skill in order to support her 3 children and became a master of self-promotion. She began to tour around the U S A and soon became sought after on the vaudeville circuit. With a good manager and agent, she was invited to demonstrate her powers in England. After a very successful 6 week run at a London theatre, she began a 2 year tour of Europe performing for royalty and heads of state. Harry Houdini who witnessed her act said “Annie Abbott was one of the greatest vaudeville acts in England”, while the renowned British illusionist John Nevil Maskelyne also praised her act highly. After Annie was introduced on stage, her manager would at great length describe her strange powers whereby she could overpower the energy of any strong men in the audience. Claims were made and then shown how she could lift as many as 4 or 6 men at the same time, yet they were unable to lift her. She was repeatedly often examined by doctors on stage who were quite mystified at her supposed powers. She even knew how to slow and stop her pulse, (a common magician’s trick) but one that fooled the physicians. In reality Annie Abbott had an uncanny knowledge of physics and how it related to leverage, balance, force and a person’s centre of gravity. After her European tour she performed all over Japan and New Zealand. She had some bad press in New Zealand when some newspapers tried to discredit her act by disclosing how some of her performance was done but this did not deter her ongoing success. Annie’s magnetic act was quite novel and unique for the period. Dynamo has succeeded recently in performing one of Annie Abbott’s feats where a very strong champion boxer failed to lift him off the ground. If this whole act was performed on stage today, it would hold little interest for an audience, because it is by its nature, is a long winded performance and quite drawn out, despite what the Georgia Magnet could do. She also by suggestion implied that she could transmit her power to children and this she demonstrated. Then began a series of disclosures made by a few different newspapers, all claiming how her effects were done. Yet despite these bold disclosures her popularity increased, as even men of science had no explanation for how she could resist the strength of heavier, stronger men, yet was able to lift a man by placing her hand on his head. When the occasion arose Annie Abbott would sometimes infer that she was also a spirit medium and thus had a great following from among spiritualists. In 2003 the International Brotherhood of Magicians wrote a fascinating article in their magazine The Linking Ring with Annie’s photograph on the cover, thus giving her full recognition as a successful, magical performer. In Annie’s case she did not use magic tricks we are familiar with but instead men and children from her audiences. She will be long remembered as an unusual act that never the less caught the attention of the Victorian age she lived in. Recently well-known author Susan J. Harrington (PhD) has written the book, Annie Abbott “The Little Georgia Magnet & the True Story of Dixie Haygood” (ISBN # 3781452847306) A book I highly recommend. It’s about women in magic and vaudeville, spiritualism, theatre and the difficulties associated with being on the road to bring their entertainments to the world. Annie Abbott the little Georgia Magnet lies at rest in the town of Milledgeville Georgia, the same town she was born in. Her act is acknowledged by the magic fraternity to be worthy enough to be remembered in our magic archives. She died on November 21st 1915. One lesson we can learn from Annie was her enormous success at self-promotion and having an act that was so different became successful. Is your act different? 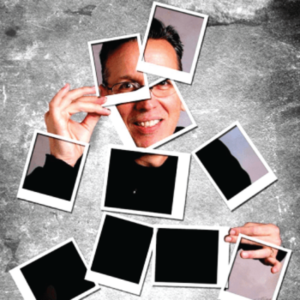 “Start living your dream as a professional entertainer by learning the strategies and tools used by leaders all around the world, as it applies specifically to magicians of all types. The skills and abilities gained from this book will give you the edge over your competitors and bolster your finances. At 331 pages and 85 chapters.. THE WEALTHY MAGICIAN is quite an undertaking. Then again, marketing is quite the subject. Richy is determined to help everyone, and willing to tackle almost every subject you can think of concerning our art. I’ve read many a book on marketing, whether it was marketing yourself, a product, or a cause. Many of the same techniques that apply to selling a product, for example, apply to selling yourself. And, as magicians, that’s exactly what we do. Why should someone hire me over the magician on the other side of town? What can he offer that I can’t? Unfortunately, many magicians think it comes down to price and who is more affordable? That could be true, but if you know anything about marketing, you understand that good marketing takes price out of the equation. Our ‘goal’ of offering the best price is perhaps our biggest downfall. The Wealthy Magician is divided into three parts: (1) Pricing your Act. (2) Marketing your Act. and (3) Selling your Act. Richy is a firm proponent of getting the highest price possible for your act. He spends page upon page guiding you in how to value yourself. Unfortunately, most magicians undervalue themselves out of fear. They are afraid of asking for what they want.. and instead ask for what they think they can get. Richy feels the typical magician is caught in a mindset of what he thinks he should be worth, as opposed to what he’s actually worth. Unfortunately, many magicians arrive at the figure of what they ‘think’ they’re worth based on what lesser magicians charge for their services. Richy goes into great detail with examples and real life stories to prove his points. The marketing portion is equally as detailed. Once you determine your true value, it’s time to put yourself out there and get recognition. There are so many ways to market yourself, and I know from experience Richy hits the nail on the head with many of his chapters… particularly ” Be Uncommon” and “Create realistic, specific, and demanding goals..” You aren’t David Copperfield.. but you also aren’t the magician down the street anymore. You’re a special performer.. a professional.. and you deserve to be treated like one. Probably the one area magicians don’t understand most is.. selling. You HAVE to sell yourself. You have to set yourself above other locals. You have to show your clients why they should contract with you. What’s in it for them? Why are you worth your fee? I’m so glad Richy Roy took time to go deep. At $49.95 THE WEALTHY MAGICIAN isn’t cheap, but he has made it worth the price. If you can learn to raise your fee even ten to twenty percent.. how much more will you make next year? This isn’t an investment in your magic library, it’s an investment in yourself and your future. $49.95 from dealers who carry the Murphy’s Magic line of products..
Jeff is a friend of the Magic Roadshow, having provided several wonderful effects for Roadshow readers. ( See this month’s free PDF for several of the effects..) Aside from being a highly popular guy who tours the world with The Illusionists, Jeff sells a few very personal items, like egg bags for example, that he uses, or has used, for years. He also provides detailed, sometimes hour long, video on their use. He also publishes a private video theater on his site that is only accessible to folks like yourself who sign up for his once-a-blue-moon emails. http://www.hobsonschoicemagic.com/ Look for the blue box near the top. A new product by Bigblindmedia, ROGUE, uses a unique set-up to create mental miracles with cards. Here’s the Ad Copy…. Central to this project is VOID – Steven’s acclaimed ‘thought-of-card’ revelation. This is a true POWERHOUSE of a trick. It might just be the fairest ‘think a card’ you will ever do with a normal deck. ‘Void’ gives you all the power of the ‘Koran Deck’ or the ‘Mind Power Deck’ but with a (slightly tweaked) regular deck of cards! I am such a fan of mental magic.. and I call this ‘mental magic’ as opposed to ‘mentalism’ in deference to a couple of friends who are full-time mentalists. Regardless, Steven has produced a well-thought-out video, almost 2 hours and 30 minutes long, full of fresh and original thinking. It’s difficult to be truly original, but I would say ROGUE is on the right side of that debate by leaps and bounds. First.. Steven goes to lengths to help buyers understand the physical side of his effects. I do notice the ad copy states ‘no gaffs or duplicates’. That’s a slightly grey area, as a gaffed card IS used.. but it’s not a part of the 52 card deck. It’s a Joker that’s modified to help set up VOID. Not a big deal.. but it is something you’ll need to take a few minutes to create. Another card will be, as they say, ‘tweaked’. I think it’s fair to call a card with a breather crimp ‘tweaked’. I’m not being picky here. Just letting you know that a couple of small modifications are employed to achieve big effects. Just as with other mind reading decks, a set-up is used. The set-up is what makes the impossible… possible. Steven’s Deviant Shuffle, a false shuffle, makes everything totally fair and disarms the spectator, allowing you to work your magic. The basis of VOID allows the performer to know the exact card selected by the spectator from a stack of approximately ten to twelve cards. Several of the effects expand on this premise, but use the same basic method. VOID also allows you to work with a stacked deck that has been ‘almost’ freely shuffled before the effect begins. The only bit of subterfuge on your part is being able to release a few cards from one stack before the cards begin to interlace.. Simple stuff. MEDLEY is probably my favorite. It’s presented as a gambling demonstration, but still has the mental magic feel, plus a rapid fire presentation that keeps the spectator off-kilter and confused… in a good way. Everyone will have their own favorite. There is nothing required of consumers beyond advanced beginner moves. If you’re reading this, chances are you are more than qualified to perform all eight of these effects. If you would like to add several strong mental magic effects to your repertoire, I recommend ROGUE. Available from magic dealers who carry the Murphy’s Magic line of products..
PASTEBOARD REVELATIONS is like the big brother of the past several ebooks by Paul Lelekis. Certain books strike me certain ways, and Pasteboard Revelations strikes me as one of my very favorite of Paul’s many magical ebooks. There is definitely something for everyone. The ebook begins with an effect that, when performed properly, will stand out in the minds of both lay people and magicians alike. Videos are provided to cover a couple of false shuffles and cement the visual aspects. Another two effects use a killer cyclical stack that has fallen from popular grace simply because another cyclical stack ‘seems’ a tad easier.. although it’s not. Mathedology and Nuclear Fusion both use different methods to reveal cards selected by two different spectators. These are ideal for couples. Cardbox Magic uses a simple technique I’ve used for many years.. and I can attest to its power when performed for lay folks. It’s ideal for walk-around and restaurant work, as a table is not needed. Marlo Poker Deal is different. A table IS needed.. but you’ll certainly get a ton of bang for your buck.. Paul has simplified this deal from the original to both make it easier and, in my opinion, more visual. I recommend Pasteboard Revelations to anyone who wants several professional effects for near nothing..
WOW! – A deck is shuffled and a card chosen and returned. The performer shuffles the deck well…yet all the red cards are separated from the black cards and the “red chosen selection” is amongst the blacks! Videos are provided to help you master the false shuffles. NUCLEAR FUSION – A fusion effect for couples or friends that will give them a ‘forever’ souvenir for “good-luck”! This is the best and most logical fusion effect ever! Perfect for restaurants..
CARD BOX MAGIC – This quick effect seems impossible! Have a card signed and lost in the deck. Place the deck into the card box. Place the cased deck under a hanky or in your shirt pocket and INSTANTLY remove the signed selection! Don’t let its simplicity fool you, I’ve used it successfully for years..
MATHEDOLOGY – Yet another great effect to play for a couple or friends! This is a coincidence effect that NO ONE will ever think is mathematically based…but it is! Very clever! One of those effects you don’t believe will work… until it does..
performer “explains” how to deal out a winning hand! The five cards picked out by the spectator turn up to be a Royal Flush in Spades! NO PACKET SWITCHES! Just clever as hell! Get your patter down, and you’ll use this over and over..
Penn & Teller: Fool Us Season 4 and 5 -Plus- 40 Masters of Illusion shows. The Rematch – Magicians who previously fooled Penn & Teller return to see if they can do so again. You can watch all the season 5 shows.. -plus- all the season 4 shows.. -plus- 40 Masters of Illusion shows. Look for the links…. All the shows stream online… Nothing to download…. This is the seventh PDF in a series of ten. First, you’ll find 44 pages full of effects from wonderful contributors. Secondly, you’ll find 30 different effects that cover a wide variety of styles. These are all effects featured in the Magic Roadshow through the years. I REALLY think you’ll enjoy this..! Actually.. I KNOW you’ll enjoy this.. This nice little 5 minute video details 18 different tricks, most involving crafts, that’s ideal for kids. Nothing shocking or new.. but definitely something to remind you of a couple of tricks I’ll bet you’ve forgotten..
Jay Sankey teaches you how to make a number of coins ‘appear’ from nowhere.. It uses a classic of magic.. in a new way. Even if you aren’t a big coin guy, you CAN do this..
Jay Sankey created the original Deck In Balloon trick back in the ’80s. Known then as ‘Airtight’ .. Jay gave David permission to use the trick. Now, he gives YOU permission to use the trick. It’s NOT self-working.. but it’s not beyond you. Everyone has their own thoughts. Watch this interesting 25 minute video performance and lecture. While most people wear silly or iconic costumes for Halloween, others put on terrifying costumes and scare the guts out of their friends. We’re talking about scary ghouls, demons, zombies, mummies, and a host of other bizarre creature-like things! Are you thinking about which Halloween costume you will wear this year? If so, you should check out our list. From the living dead to the bizarre, these are the 25 Most Terrifying Halloween Costumes. In celebration of Halloween.. I’ve included a video of 10 strange photos found on the internet in years past. No promises.. no guarantees.. just weird. Almost 14 minutes in length. I truly enjoy coming up with something different for the Roadshow. The internet can be a wonderful resource -if- you’re lucky enough to run across the right combination of key words during a search. This was one of those searches…. “Craps is a unique casino game because the shooter directly affects (i.e., picks up and throws) the gambling instruments (dice). Craps players, more than other casino gamblers, may be the most susceptible to Langer’s (1975) illusion of control where they think they can control the outcome of a random game. In James Henslin’s article “Craps and Magic” (1967) subjects were asked to roll a die. He found that when they wanted high numbers they threw hard and when the wanted low numbers they threw softly. From the physics behind the flight of dice to the eight critical steps to mastering the act of tossing two dice, we reveal the true story behind the Dominator’s phenomenal rise to riches through a seemingly impossible challenge – to control the outcome of a craps game with the flick of a wrist. The Full Contents of Johnny Fox’s Freakatorium. Fox’s Barnumesque museum featured natural and unnatural oddities, many related to circus sideshow performers and attractions, as well as historical objects d’art, stage illusions, photographs, and tabloid style ephemera. Chicago, Il, October 18, 2018- Potter & Potter Auctions is pleased to announce their almost 700 lot Freakatorium: The Collection of Johnny Fox Auction to be held on Saturday, November 10, 2018 starting at 10am at the company’s gallery, located at 3759 N. Ravenswood Ave., Chicago, IL 60613. Renowned sword swallower, magician, and performer John Robert Fox (1953-2017) amassed a huge spectrum of grotesque, bizarro, and surreal curiosities which he displayed at his Freakatorium, “El Museo Loco,” in New York City from 1999-2005. All of these wonders will be on display and available for preview on Thursday, November 8th and Friday, November 9th from 10:00am to 5:00pm in the Potter & Potter facility. Many of the sale’s top lots are associated with the big top and other traveling entertainment venues of the 19th and 20th century. Lot #1, a brightly painted sideshow banner by the “Picasso” of circus art Fred Johnson (1892-1990) is estimated at $4,000-6,000. Titled Freaks Past and Present, this c. 1950 piece from the O’Henry Tent & Awning Company of Chicago measures 115” x 316” and depicts an array of famous sideshow acts, including a three-legged man, a two-headed man, a frog boy, and others. The images are flanked by bright panels of text. Lot #15, a Snap Wyatt Studios c. 1945 Freaks. Alive entrance-type canvas sideshow banner is estimated at $3,000-5,000. This 100-½” x 342” masterpiece features sideshow attractions such as the alligator skin lady, a conehead, a sword swallower, and more. It is branded with two stenciled Snap Wyatt logos. Lot #338, a color lithograph depicting Jumbo the elephant giving kids rides on his back is estimated at $3,000-5,000. This c. 1882 linen backed poster measures 37” x 31” and was produced by Strobridge of Cincinnati. Lot #334, a linen backed color lithograph entitled P.T. Barnum’s and Great London Combined. Santa Claus in His Royal Chariot of State is estimated at $1,200-1,500. This c. 1880s example, also by Strobridge, shows Father Christmas distributing toys to a crowd of children, along with two reindeer and a driver. It measures 35-¼” x 29-¼”. And lot #56, thirteen signs for the Freakatorium – based on legacy circus and sideshow themes – are estimated at $400-600. These sheet metal signs were painted by Adrian Clara and include a 39” x 53” “Cabinet of Curiosities” sign and a dozen smaller exhibition placards. Fox’s New York City Freakatorium museum remarkably showcased over 1,000 oddities within a 500 square foot venue. These objects ranged from antique to modern, organic to configured, and functional to made purely for shock value. Items featuring human or animal body parts have a leg up in this collection. Lot #559, a c. 16th century pre-Columbian human skull from Oaxaca, Mexico is estimated at $1,000-1,500. Its eyes are covered in seashell discs. The skull is believed to be of the Zapotec culture, an indigenous pre-Columbian civilization that flourished in the Valley of Oaxaca in Mesoamerica over 2,500 years ago. Lot #293, a collection of seven life sized wax arms and hands from various museum wax figures is estimated at $80-125. These were likely made by Gems of London in Great Britain in the 1960s. Lot #645, a human head on a sword sideshow illusion, is estimated at $500-1,000. This curiosity features a disembodied human head – alive, talking, and moving – sitting on the blade of a sword resting across the arms of a large wooden chair. And lot #281, a 12” long “Fiji Mermaid” made by Mark Frierson of Tampa in c. 1999 is estimated at $300-400. This desiccated, mythical creature – first introduced to the world in 1842 by P.T. Barnum at his Barnum’s American Museum – is assembled from a hairy man’s head, human arms, lizard like claws, a torso with exterior ribbing, and a fish tail. Can’t-look-away antiquities, props, and artifacts from the Freakatorium are certain to also capture worldwide attention through this sale. Lot #282, a collection of various wooden items carved by Charles Tripp (1855-1930) using his feet is estimated at $1,000-1,500. Tripp was born without arms, but nevertheless managed to become a skilled carpenter and calligrapher. The lot includes two pairs of wooden scissors, a wooden chain with twenty-six links and a three-piece clasp, two carpenter’s dividers, a monogram for James H. Boyer – the person for whom the items were carved – as well as two postcards and a cabinet photo. Lot #533, a 1763 coffin-shaped wood container for holy relics, is estimated at $800-1,200. This reliquary is decorated with a glass front bounded by gilt roping and oval compartments and includes ex-ossibus relics of eight saints. Its back features an attestation from the Abbott of St. Matthias’ Church Parish in Genoa, Italy, dated August 14, 1763, indicating that the relics were authenticated on April 11, 1619 by Abbott D. Fabiano Richerio. Lot #247, a finely made miniature boot reportedly owned by Charles S. Stratton, better known as Tom Thumb (1838-1883) is estimated at $500-750. The footwear is detailed with rose-colored leather lining and a floral pattern stamped in the sole. It measures about 6-¾” high and 4-¾” long and is accompanied by a typed exhibit card bearing a brief bio of Tom Thumb, and stating, “This boot was worn by him.” And lot #650, Fox’s “Cracker Shooting” helmet prop, is estimated at $400-600. This repurposed WWI helmet was used by Fox for his version of the stunt made famous by Vaudeville showman Kar-Mi (Joseph Hallworth, 1872-1956), in which the performer swallows a loaded gun barrel, then shoots a cracker off of the head of an audience volunteer with the bullet. This Freakatorium auction, like many of Potter & Potter’s world-class events, includes a number of important archives. These collections of primary source materials are ideal for academic institutions, historical societies, specialty museums, or independent researchers. Lot #261, an archive of materials from Robert Marshall, better known as Marshall the Mystic (1876-1943) is estimated at $2,000-3,000. Marshall performed variously as a hat juggler, magician, pantomimist, and medical lecturer. This collection includes approximately 100 photographs, as well as snapshots, postcards, glass negatives, drawings, and about 100 additional pieces of performance ephemera. Lot #39, an archive of Johnny Eck “Half Boy” materials from the 1920s -60s is estimated at $800-1,200. John Eckhardt (1911-1991) was born without the lower half of his torso yet managed to overcome this enormous disability to become a world-famous sideshow performer, as well as a movie actor, artist, musician, photographer, illusionist, penny arcade owner, Punch and Judy operator, and expert model maker. Eck’s archive includes thirteen original photographs, two original typed signed letters, and additional photocopied letters. And lot #264, an archive of research on human oddities collected by William Woodworth of Cambridge, Massachusetts, is estimated at $800-1,200. This cache, collected over the 1880s-1920s timeframe, includes manuscripts, clippings, photographs, cabinet cards, and letters detailing Woodworth’s study of human oddities, including Siamese twin and humans with missing legs and other mutations. Books, photographs, drawings, and other ephemeral items helped the Freakatorium tell its stories through these time-capsule materials. Lot #241, a book entitled Greatest Wonder On Earth. Jo! Jo! The Dog Faced Man. published in c. 1882 by Popular Publishing of New York is estimated at $250-350. This rare, eight page book features hand-colored pictorial wrappers and was most likely sold after Jo Jo’s (Fedor Adrianovich Jeftichew, 1868-1904) performances on the Barnum, Bailey & Hutchinson circus sideshow. Lot #94, two silver prints of albino sword swallower Lady Sandra Reed from c. 1970, are estimated at $1,000-1,500. They are attributed to photographer Diane Arbus (1923-1971) and include one shot of the performer kneeling and the second with a sword raised in preparation for the attempt. The prints are believed to be unique, and are accompanied by a note of provenance by Reed. Reed held the world’s record for the number of swords swallowed by a woman. And lot #390, a whiteprint plan for Coney Island’s famous “The Whip” carnival ride, is estimated at $600-800. Originally patented and manufactured in 1915, this plan details the 1918 iteration of W.F. Mangels’ most famous ride invention. This sale includes about ten early 20th century ride plans created by Mangels for Coney Island’s emerging entertainment business. This grand event rounds out with robust offerings of taxidermy, antiques, artwork, and selections that simply defy conventional categories. Lot #245, a brass “Champion Strong Woman of the World “ trophy belt presented to Minerva (Josephine Blatt., c. 1869-1923) by Richard K. Fox of The Police Gazette in 1893 New York is estimated at $3,000-5,000. Lot #43, a detailed illustration of a barber and wig shop, executed entirely in human hair, is estimated at $600-900. This French work, dating from the 19th century, measures 26” x 22-½” and features a distracted barber with straight razor in hand, a wary customer, a wig restorer at work, and other characters. And bidders are certain to lock horns over lot #287, a “unicorn skull” made by artist Mark Frierson in 1999. It was the displayed at the Freakatorium under a banner reading “skulls are extremely rare and this particular specimen is only one of a handful known to exist in the world today. It was uncovered from beneath the ruins of an ancient medieval castle in Europe.” The unicorn skull is estimated at $500-700 and includes its original Freakatorium signage. Potter & Potter, founded in 2007, is a Chicago area auction house specializing in paper Americana, vintage advertising, rare books, playing cards, gambling memorabilia, posters, fine prints, vintage toys, and magicana – antiques and collectibles related to magic and magicians. The company’s next sale, featuring hundreds of important vintage travel posters, will be held on December 1, 2018. For more information, please see www.potterauctions.com. Follow us on Facebook (potterandpotterauctions), Twitter (PnPAuctions), and Instagram (potterauctions).